It is hard to believe these cookie gems have only 5 ingredients and no flour. Loaded with both peanut butter and , what is not to love in this traditional recipe? Beat sugar, peanut butter, egg, and vanilla in a large mixing bowl on medium speed for 2 minutes. The mixture will appear crumbly. In the palms of your hands, compress and roll dough into 1-inch balls. Place 1 inch apart on ungreased cookie sheet. After 10 minutes, remove cookies from oven. Quickly and gently place one chocolate piece in the center of each hot cookie, pressing down lightly. Return to oven and bake an additional 2 minutes to slightly melt the chocolate. Remove from the oven and gently tap cookie sheets on the counter once or twice to settle the chocolate into the cookies. Do not rap too hard. You want a bit of the chocolate points to remain. 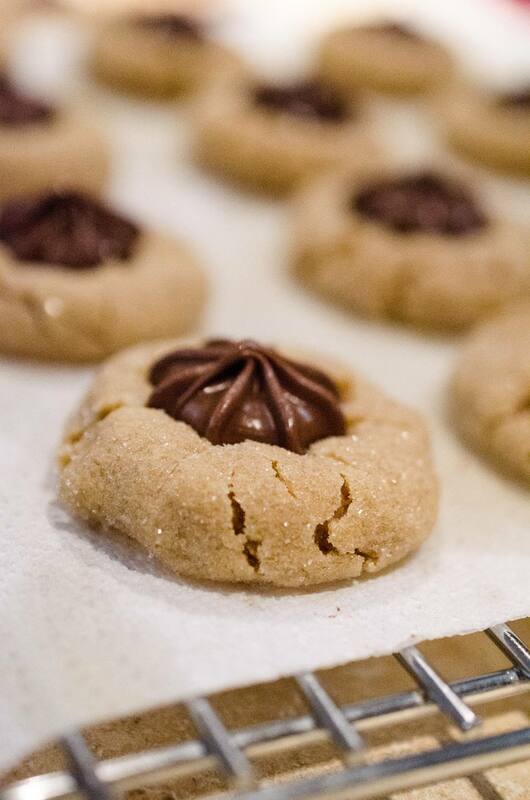 Let cookies sit on the pans until the pans are cool to the touch. Refrigerate to re-set the chocolate.